Back in June 2006, when the housing market peaked, the prospect of a five-year national housing bust seemed unimaginable to most people. 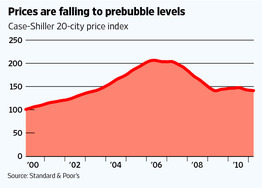 And yet here we are, with the latest Standard & Poor's Case-Shiller index showing that prices hit new bear-market lows, falling back to 2002 levels nationally and to 1990s levels in some battered regions. Despite all the gloom, however, there are growing indications that it is a good time to buy. Mortgage rates, which fell to 4.55% for the week ending June 2, according to Freddie Mac, are near 50-year lows. 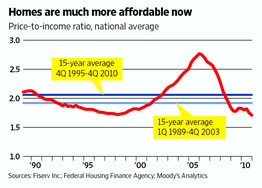 Homes have become more affordable than they have been in years: According to Moody's Analytics, the ratio of home prices to income is now 20.9% lower than the 15-year average through 2010, and 12.5% lower than the 1989-2004 average. A historic glut of homes, meanwhile, has created a buyer's market: There were about 15 million vacant homes in the U.S. last year, according to John Burns Real Estate ConsultingInc.—some 3.1 million more than normal. Such conditions might not last long. Moody's Analytics predicts that the number of distressed sales will begin to fall in 2013, and that prices will begin to edge upward then. Home building is at a virtual standstill, so the supply overhang isn't likely to get much worse. Meanwhile, demographic indicators such as 'household formation'—the number of new households each year—are on the rise, and promise to take a bite out of the glut in coming years. The upshot: 'While we might not see rapid growth in the next couple of years, there are a tremendous number of positive signs that could lead to a rebound,' says Anthony Sanders, a real-estate finance professor at George Mason University. The short-term outlook isn't encouraging. Job growth remains weak, foreclosure sales are making up more of the market, and economists are predicting that home prices will fall more in the coming months. But the long-term benefits of homeownership remain very much intact. For now, at least, you can deduct the mortgage interest on your taxes—a big perk for people in higher tax brackets. You get to paint your walls any color you wish, without having to clear it with a landlord. And assuming you can buy a home for about the same price as you can rent one, buying will give you the ability one day to live rent-free. Come retirement time, a paid-off mortgage means your monthly expenses are significantly reduced, and you have a chunk of equity to play with. Here is a glimmer of what the future may hold: While overall home prices fell by 7.5% in April over the same period a year earlier, according to CoreLogic, a Santa Ana, Calif., provider of real-estate data and analytics, if you exclude distressed sales, prices were off just 0.5%. So if you are in a market that isn't battered by foreclosures, you may be close to a bottom already. 'The regular marketplace is hanging tough,' says CoreLogic chief economist Mark Fleming. Household formation fell during the economic downturn as a weak economy led some people to stay in school, double up with roommates or move in with family members. According to Moody's Analytics, the number of new households renting or owning a home dropped to 578,000 in 2008 from nearly 2 million in 2005, just before the peak of the housing boom. But household formation increased to nearly 950,000 last year, says Moody's, and should average 1.2 million over the next decade. That, combined with increased obsolescence and higher demand for second homes, should begin sopping up excess inventory in much of the country over the next two years, Moody's says. 'Whatever the excess supply of housing is, it is shrinking pretty fast,' says Thomas Lawler, an independent housing economist. Some of the uptick in household formation is likely to come from the leading edge of the echo baby boomers, who have been waiting for the economy to recover before striking out on their own, says William Frey, a demographer with the Brookings Institution. That is likely to fuel an increase in demand for both rental apartments and starter homes. 'When things do pick up, there will be this pent-up demand for everything involved with starting a household,' Mr. Frey says. Of course, when prices in healthier regions begin to rise, many would-be sellers who have sat on the sidelines could begin putting homes on the market, muting the price gains at first, says Susan Wachter, a professor of real estate and finance at the University of Pennsylvania's Wharton School. Even so, she expects home prices to stabilize and begin to strengthen over the next two or three years. There also are some powerful demographic cross-currents worth considering. The first baby boomers turned 65 in January, an age when demand for new homes falls and many begin to think about downsizing. 'The baby-boom generation pushed prices up as they got older,' says Dowell Myers, a professor of urban planning and demography at the University of Southern California. But in the coming years, 'boomers will start flooding the market on the supply side' with larger homes, while fueling new demand for smaller properties with more services and amenities. Rising home prices made renting cheaper than buying in many parts of the country. But that dynamic has begun to change: Housing affordability, as measured by the ratio of median home prices to median household incomes, has fallen below pre-housing bubble levels in just over two-thirds of the country, according to an analysis of more than 380 metro areas by Moody's Analytics. Renting is still cheaper than buying in most markets, but rising rents and falling house prices mean that, in some areas, this won't be the case for long. Buying a home is already cheaper than renting in Chicago, Cleveland, Detroit and Orlando, Fla., according to Moody's Analytics. In other markets, including Dallas, Las Vegas and Sacramento, Cailf., the equation is likely to soon turn in favor of homeownership if current trends persist, the firm says. In Ann Arbor, Mich., where home prices fell 11.2% between 2007 and 2010, according to Fiserv Case-Shiller, housing affordability has risen well above historical levels, according to Moody's Analytics. That is good news for home buyers such as Steven Upton, a 42-year-old photographer, who in June will close on four-bedroom brick house on 10 acres in an upscale community in Ann Arbor. Mr. Upton paid $400,000 for the home, which previously listed for $600,000. 'It's a tremendous deal,' he says. The strength of the housing market depends largely on the economy. Rising incomes and increased employment tend to give more would-be buyers confidence and buying power. For now, job growth remains sluggish: On Friday the Labor Department reported that just 54,000 jobs were created in May, far below expectations. But signs of how a stronger job market could fuel housing demand are evident in the Dallas metro area, which added 83,100 new jobs in the 12 months ending in April—the largest gain in the nation, according to the Bureau of Labor Statistics. Dallas never had a big housing boom or bust and has benefited from trade with Mexico, a strong telecommunications sector and a central location. The opportunities for a job with more responsibility drew Duane and Linda Elmer to Dallas from Des Moines, Iowa, where Mr. Elmer was a banker for nine years. The couple has agreed to pay $415,000 for a four-bedroom, four-bath house with a Jacuzzi and pool. Their Des Moines home, purchased nine years ago for $410,000, is on the market for $390,000. 'We are willing to take the loss for the opportunity to live in a more diverse community and to take a job with greater breadth of responsibilities,' Mr. Elmer says. A similar influx of job seekers is fueling housing demand in the Washington area, where 25,700 new jobs were added in the 12 months since April 2010. Washington was the only one of the 20 cities tracked by Standard & Poor's and Case-Shiller that saw home prices rise both on a month-to-month and year-over-year basis. Mortgage financing remains plentiful for borrowers with good credit scores and solid employment histories. But for borrowers who don't fit traditional lending standards, getting a loan can still be nearly impossible. In the first quarter, about 10% of banks tightened standards for nontraditional loans, according to the Federal Reserve. Meanwhile, higher down-payment standards are locking some would-be buyers out of the market. Just 35% of renters have the minimum 3.5% down payment needed for an FHA loan on the median-priced home in their market, according to a recent survey by Zelman Associates. Credit is likely to remain tight for at least the next six months, says Clifford Rossi, a former Citigroup Inc. consumer-lending executive who teaches at the University of Maryland. That will be welcome news to borrowers like Greg Silver. The 50-year-old real-estate developer would like to buy a second home, but hasn't been able to secure a jumbo mortgage because his income consists of capital gains from sales of the properties he develops. Mr. Silver closed three sales in the past 12 months, netting him a total of more than $25 million, but didn't record any capital gains in 2008 and 2009. Sure, he could use some of that cash to buy a home outright, but he would prefer to mortgage it, get the tax deduction and keep his cash free for business purposes. 'It's a little devastating,' says Mr. Silver, who is living in Greenwich, Conn. The long-term case for buying over renting remains in force. Yet nowadays, 'People are simply scared,' says Aaron Galvin, chief executive of Luxury Living Chicago, which finds rental apartments for wealthy clients. Mr. Galvin says he has seen a 30% increase in business in the last year, driven by would-be home buyers who can afford to purchase a property but are choosing not to do so. The portion of Americans who believe homeownership is a safe investment dropped to 66% in the first quarter from 83% in 2006, according to Fannie Mae, the government-controlled mortgage company. But it isn't clear whether the fear will result in a prolonged change in attitudes, as during the Great Depression, or have little long-term impact, as was the case for the housing bust that shook California and the Northeast in the late 1980s and early 1990s. Eighty-seven percent of people surveyed by Fannie Mae said they preferred owning to renting, though access to schools, control over one's environment and other quality-of-life issues now are seen as the key benefits of homeownership, with building wealth and other financial factors viewed as less important. In addition, 67% of renters surveyed by Zelman Associates said they planned to buy a home in the next five years. Jeffrey Connor may be a bellwether for the future of the housing market. The 40-year-old finance director at a corporate law firm says he thought briefly about buying a house when he moved to Chicago from Washington in October. But he opted instead to rent a luxury two-story apartment in downtown Chicago for $3,559 a month. Mr. Connor says it will take substantial job growth and a sharp drop in foreclosures to convince him to buy. 'The market is clearly soft,' he says, 'especially when we consider it good news that the unemployment rate is hovering around 9% instead of 10%.' Mr. Connor says he isn't worried about missing out on today's low interest rates and will consider buying once unemployment falls to 6%.